Volcanic gases rise from a fissure in the Leilani Estates subdivision during ongoing eruptions of the Kilauea Volcano in Hawaii, May 14, 2018. People nixing vacations to Hawaii's Big island has cost the tourism industry millions of dollars as the top attraction, Kilauea volcano, keeps spewing lava. Cancellations from May through July have hit at least $5 million, said Ross Birch, executive director of the island's tourism board. This is the "first leak we're seeing out of the bucket,'' Birch said. 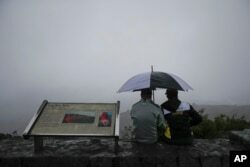 A couple sits on the edge of the Jaggar Museum's overlook to view Kilauea's summit crater in Volcanoes National Park, Hawaii, May 10, 2018. Tourism is one of Hawaii's biggest industries and a big part of the local economy. The Big Island topped other islands in the archipelago pulling in $2.5 billion in revenue last year. The National Weather Service has warned residents of "light ashfall'' throughout the day in Kau, the island's southernmost district, after a burst of volcanic emissions around 9 a.m. The U.S. Geological Survey's Hawaiian Volcano Observatory said the flow from the crack that emerged Sunday was heading on a path that would take it to the ocean, about 2 miles (3 kilometers) away. No homes or roads were threatened by the flow. 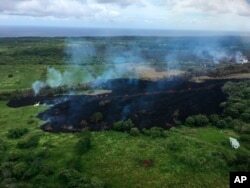 In this May 13, 2018 photo released by the U.S. Geological Survey, gases rise from a fissure near Pahoa, Hawaii. "I've actually seen rocks fly over the tree line, and I can feel it in my body," Schott said. "It's like a nuclear reaction or something." "The appearance of the fissures in the past couple of days does not change the overall picture or concern,'' Geological Survey scientist Steve Brantley said. "I guess it's just part of living on the island,'' Ricks said. He said he wasn't really afraid of the destruction happening around him. "In a way, it's kind of exciting to see what's going on and be this close to it,'' Christian Ricks said.